The small interlaced Trinity knots on these sterling silver Celtic stud earrings from the Dara knot. These small sterling silver Celtic earrings are round studs that feature four intertwined Trinity knots that form the Dara or strength knot. These small stud earrings, with push on butterfly backs, measure 1/4" diameter. 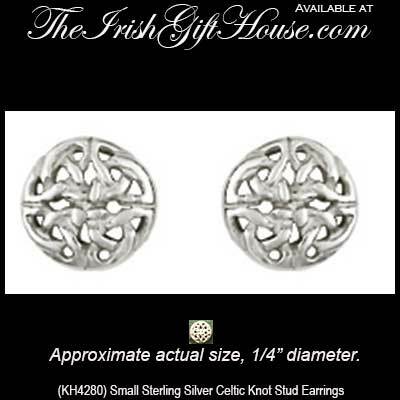 The sterling silver Dara knot earrings are made in Scotland by Kit Heath Jewelry and are gift boxed with a Celtic knot history card that is complements of The Irish Gift House.